Valencia, Spain is a charming city with plenty of history. It has an impressive Old Town near the beach, and it's best to stay close by Old Town to maximize your time. If you can find a place where you can walk into the center of the town, then you can likely walk to most of the sights and attractions that you'd want to see. Valencia attracts all types of travelers, and there are accommodation options that range from affordable and simple to social and vibrant. If you're traveling on a budget, alone, or want to meet other travelers, then hostels usually offer the most social environment at an affordable price. How much do hostels in Valencia cost? What are the best hostels in Valencia for backpackers and budget travelers? A good hostel of solo travellers, couples, and small groups. Home Youth Hostel is one of several hostels operated by Feetup Hostels in Valencia, Spain. Other locations include Home Backpackers and Rooms Deluxe Hostel. Home Youth Hostel is located in the Barrio El Carmen, and is very close to Central Market. It's also a short walk to the train station. The hostel is a comfortable place to stay with a relaxed atmosphere. It's not hard to meet other travelers, and if you're traveling alone, it won't be long before you make a few friends. If you want to just relax in the hostel, there are several great common areas. The lounge is a great place to watch a movie. There's a full kitchen where you can prepare a meal as well. The staff at the hostel is also very helpful and knowledgeable. They can help you arrange bicycle rentals, or any number of tours or activities in the area. If you're looking for a fun and comfortable place to stay, then Home Youth Hostel is a great option. A great hostel for couples and small groups. Russafa is a comfortable place to stay in Valencia. It's just five minutes from the train station and the rooms are all well furnished and nicely decorated. It's a clean hostel with plenty of amenities for guests including a picnic area, free wi-fi, and free security lockers. Both private rooms and dorms are available. If you're traveling alone, there are single private rooms where you can have your own space for a reasonable price. There are also doubles and triples available. Dorms only sleep three people and are split by gender with male only and female only rooms available. There are shared bathrooms, with one bathroom available for every three rooms. This is a great hostel in a good location with friendly staff. If you're traveling alone and want a little privacy and space to yourself, then it's an affordable and pleasant place to spend your time. A great hostel of solo travellers, couples, and groups of friends. The River Hostel is a relatively new hostel that's located in a historic building between the city centre and Turia Park. It's a popular hostel, so there are usually other guests around that you can hang out with and chat. There's a common area where many guests enjoy relaxing, but there's also a bar and a shared kitchen where you'll find people lingering as well. The bar is open 24 hours a day, so it's not hard to find people there any time of day. There are many great amenities available to guests including a breakfast buffet for a small additional fee. The staff is great and can help with any number of arrangements. They can help you with tours of the city or offer their expertise on the sights and activities around town. Both private rooms and dorms are available. Dorms sleep four, six, eight, ten, and twelve guests. Both mixed and female only rooms are available. A great hotel for solo travellers, couples, families, and backpackers. Hostal Moratin is another popular option in the area. It's a family run hotel, that is not a traditional hostel. If you're traveling on a budget and looking for an affordable hotel to stay at with great amenities for independent travelers, then this is a good option. It has a strong history in the area and is a quiet place to stay that appeals to a variety of travel types including families, business travelers and backpackers. If you're traveling alone and want an affordable place to stay that feels more like a hotel than a hostel, then this is a good option. 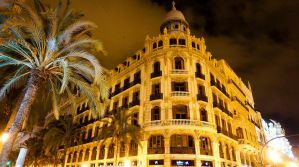 Hostal Moratin is located in the middle of downtown Valencia right next to the Plaza Ayuntamiento and it's surrounded by many of the city's best restaurants and nightlife. Public transportation is easily accessible and provides easy access to the beach and airport. There are several great amenities available through the hotel including a free continental breakfast, free wi-fi, and car parking. Luggage storage is available as well. Only private rooms are available, no dorms. If you're traveling alone there's an affordable single room available. There are also twin, double, and triple bed rooms available.